Each year, like most people I draft resolutions. But a few years ago, instead of just throwing ideas into the wind, I decided I will make a conscious effort to improve one thing and one thing only in my life annually. I started this about five years ago, when I gave up soda. Each year since I’ve tackled things such as giving up coffee or fast food. This year becoming a reader is my task and reading 24 books is my goal. I’ve always been a picky reader. Seldom would I find books that interested my enough that I would shift time from another activity to read. More often than not, I would find a good book, read it over the course of a month or so, then have nothing to continue to when I finished. Biographies and other non-fiction books have always seemed to hold my interest the most, so I’ve started out the year with a list of books that I thought would interest me and I’ve kept an eye out for them at libraries and thrift stores. My Commute – Daily I spend about 45 minutes driving, so I signed up for an account at Audible.com so I could get audio books. Early in the year, I discovered the website GoodReads.com, along with their Android App. Using this site, I manage what I’ve read, what I want to read, as well as my ever growing inventory of travel/reference books. GoodReads also has a “Reading Challenge”, to help you track your goal of reading a set number of books during the year. When I find that my “TO READ” list is getting short, I stop by Barnes & Noble or Books-A-Million and break out my GoodReads app with the barcode scanner to fill it back up. As I find books that interest me, I simply scan it and it is automatically added to my “TO READ” list. 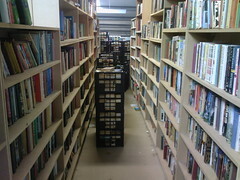 Using my GoodReads TO-READ list (on my phone) at libraries and thrift stores I frequent has made finding books easy. I truly believe that I’m becoming the reader that I’ve always wanted to be. I look forward to opening up my current book and seeing what happens next. It is no longer a chore; it is becoming a retreat. Thus far my resolution has been so successful (I’m currently averaging about a book a week) that I’ve increased my goal from from 24 books to 35.